My dad grew up in an Italian home in New York and he loved Italian food, including pizza. Because of this, my mother often made pizza for our family. She would make the dough and roll it out to fit a rectangular baking pan. The edges of the dough were pushed and pulled to form a crust edge all the way around the pan. Next, she would drizzle one or two tablespoons of oil on the dough and spread it out to cover lightly. Tomato sauce was spread evenly over the oiled surface and sprinkled with favorite seasonings. The best part of this pizza construction was what came next...the toppings. Often it was ground beef or Italian sausage which had been browned, black olive slices and mushrooms and, of course, cheese. While the pizza smelled wonderful as it baked, I was never happy with the crust...it was not crisp enough and was often too thin. My dad seemed to enjoy the pizza no matter how it turned out. He would pick up a pizza square, fold it in half and eat it like that. 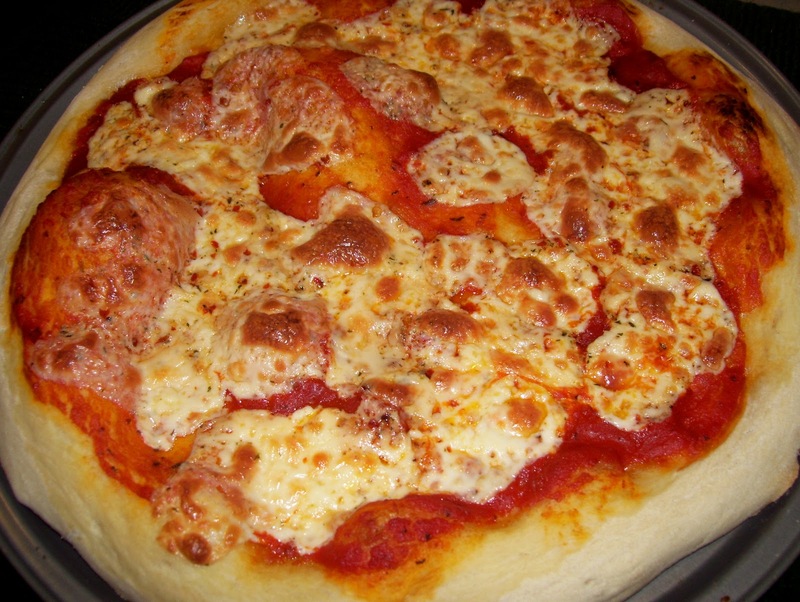 The topping ingredients are very important for a pizza, but besides a wonderful sauce, I think that the crust makes or breaks the total enjoyment of pizza eating. I discovered that by allowing the dough to rest in the refrigerator for several hours, the texture and crispness of the baked crust will be greatly enhanced.. Many people use a pizza stone for baking; an up-side down baking sheet or a perforated pizza pan can also be used. Try not to overload the dough with too much of anything...it creates a soggy crust. Dough may also be divided wrapped and frozen for up to 3 months. Thaw and proceed with directions. Bring dough to room temperature, covered and then roll out. One half of the dough will yield a 10-12- inch circle. Use the baking directions that came with your baking stone if you are using one. If using a baking sheet, sprinkle the back side of the pan with corn meal. Preheat oven to 425 degrees. Gently shape the dough, place on prepared pan. *(Hint below) Add desired ingredients on dough and place pan in oven and bake until the crust is golden and the toppings are cooked and the cheese is melted, 10-12 minutes. Mixing by hand: place yeast and sugar in a bowl. Add 1 1/4 C of warm water and milk and mix well. Let stand until the mixture begins to foam. Place the flour and salt in a large bowl. Mix evenly. Add the yeast mixture to the flour and combine until dough holds together. Hint: (I rolled out half of the dough, spread 2 tsp olive oil over the surface, added a minimal amount of flavored sauce and thin pieces of marinated mozzarella cheese. Baked at 425 degrees for 12 minutes).